The Novotel Lille Centre Grand Place is a 3 star hotel in the heart of Lille, close to the Grand Place and the old city. The hotel offers 104 airconditioned rooms, a restaurant, a bar and four meeting rooms for your conferences and seminars. This hotel i. s equally suited to a business trip or a holiday in Lille with your partner or family. Guests also enjoy the benefit of a gym and a secure public car park adjoining the hotel. Coming from Paris, Gent, Brussels or Dunkerque, head towards Lille Centre then Parking du Nouveau Siecle the hotel car park . 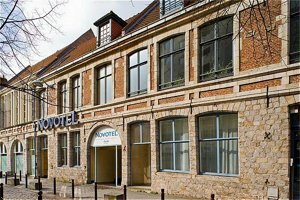 Novotel Lille Centre is located in the heart of the city centre of Lille, a few minutes from the railway stations and the GrandPalais. Enjoy strolling the pedestrian streets of superb historic Lille and the numerous traditional and cultural acts and events in the centre of the city. CHR B CALMETTE 4 CANTONS.